Do you know what makes us human? Well, an article over at phys.org attempted to tackle that question. They’re attempting to figure out what separates humans from other animals, including chimpanzees. Some of the usual differences include our upright stance, the shape of our toes, the size of our brains, language, culture, and a huge mental gap. Professor Thomas Suddendorf from the University of Queensland proposed a few new ideas: the ability of humans to imagine and reflect on different situations, and our deep-seated drive to link our scenario-building minds together. He says humans have the ability to imagine the past and the future, and they can cooperate with other humans to cause a particular scenario to happen. All this is well and good, but what bothered me about this article wasn’t the usual evolutionary spin, but the direct assault on God and religion. Yes, the author of this article mocked the idea that humans are special and made in the image of God. He claims that it’s “unfortunate baggage” that some people actually believe in creation rather than a “scientific, testable view of the world.” And he calls belief in the Genesis account of creation a “perversion” of evolutionary thinking and “taxonomic chauvinism”. I find this type of thinking unfortunate, particularly if God does exist and formed man in his image as the Bible testifies. Christianity, in contrast to evolutionary thinking, provides a perfect explanation as to what makes us human: we were created in God’s image fully human and with a soul. We were also created with some superficial similarities to various organisms, along with unique differences. I also find it sad (but not surprising) that the author believes evolution is scientific and testable when it isn’t. None of his evolutionary beliefs can be tested and validated. He must simply believe the conclusions by faith. 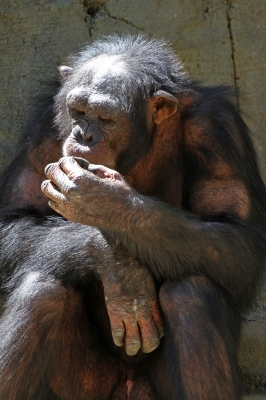 He and other scientists are able to identify and analyze certain traits and similarities we share with apes, and they’re able to chart those differences on a graph and make evolutionary assumptions, but they’re unable to test their beliefs according to the scientific method and demonstrate that we share a common ancestor with apes. So I find it ironic and hypocritical that he claims science in the name of those who believe in evolution, while refusing any scientific credibility to those who believe in creation. I happen to find God’s unique creation of man to be more believable than any evolutionary model proposed. There’s a clear, humongous gap between humans and every other animal, and there’s no reason to hold onto the idea that, by chance, we evolved and advanced way beyond any other organism, leaving them in the dust. I agree about man being made in God’s image. Yet even with that bit of knowledge, it is interesting (to some) to reflect on precisely what attributes are entailed in that image. The ability to envision, plan, and create something new is one attribute that comes to mind. The article clearly admits that the Big Bang theory is unfalsifiable. (The Big Bang is of course a needed precursor to spontaneous life and then evolution). In the context of the article, to be unfalsifiable means that the Big Bang is taken on faith. I was pretty stunned when I read that admission. Belief in the Big Bang is a religious belief. Yes, identifying and analyzing the unique traits man possesses is definitely a worthwhile endeavor. And thanks for the article. I wasn’t aware the finding had been overturned. I’ll have to post a follow-up article on it.